Potent new EP from Night Slugs introducing Egyptrixx + remixes from Ikonika (Hyperdub) and Kingdom (Fool's Gold). Limited copies only! Bok Bok and L-Vis 1990's NIGHT SLUGS label returns with its second official release: "The Only Way Up" EP by unique Toronto-based producer EGYPTRIXX. 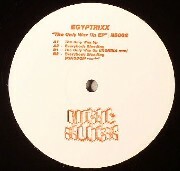 Egyptrixx makes celestial club music; jeep jams for a Saturn desert. Over the years his tracks have called on diverse styles from booty house to dubstep, but all of them share an exhilarating wrong-but-right tension – a shifting balance between melodic and dissonant, rapturous and antisocial. GERNOT MODESELEKTOR - "Great, I love it!" _MARTYN_ - "This release is all about the original "The Only Way Up" and the Ikonika mix for me !!!" _BEN UFO_ - "It's great, played Ikonika's mix in Bristol on friday." _ONEMAN_ - "I'm really into the ikonika mix, nice one for early on in the set. Definitely the pick of the bunch for me!" _UNTOLD_ - "another wicked release. Favourite mix is the Ikonika, and love the flange funk on "Everybody Bleeding". WILL PLAY ALL DAY" _DEADBOY_ - "Loving the late night warehouse vibes on the Ikonika and Cubic Zirconia remixes." _DEADBOY_ - "Loving the late night warehouse vibes on the Ikonika and Cubic Zirconia remixes." _HOT CITY _- "We've been playing out "Everybody Bleeding" out for while now, brilliant track" _SUBEENA (Planet Mu)_ - "Played the Ikonika remix on my show last night. Will play the other ones too, great stuff!" _COSMIN TRG_ - "The Kingdom remix is the winner for me, loving it to the bone. Will drop in every set! Ikonika's interpretation will deffo get rinsed too." - "The Only Way Up"